At the tender and tumultuous age of thirteen, Steven Weiss-Smith’s father passed away from cancer. As Steven matured, he wondered about his father, wanting to know who he was as a person and realizing that he’d been too young to ask all of the questions he now wanted answered. The need for these answers became greater as he became a father for the first time. 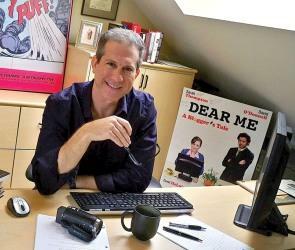 Combining his background as a screenwriter and author, Steven created a way to capture the true stories of people’s lives in an entertaining way where the reader could go on a journey with them, understand their thoughts and experience their feelings rather than just getting at a timeline of events. BioNovel™ was born. “For the past twenty years, my writing experience taught me what makes a story come alive. Screenwriters need to know their characters inside out. We have to hear their voices in our heads as we write. This lends itself wonderfully in writing other people’s lives,” says Steven. BioNovel is an opportunity to capture the important stories and moments in your life. Your true stories are written in third person like a best-selling novel, entertaining and engaging. With your BioNovel, you can share your life with your children and grandchildren, creating a special connection with those you love. Through a series of video-recorded sessions, Steven uses his psychology education to create a comfortable environment for you to share your stories. You’ll find that the sessions are both enjoyable and cathartic. Upon completion, your BioNovel is bound in a hardcover book with a professionally designed cover. There are several options for BioNovels starting with a Single Chapter book and going all the way up to an entire life story. One lucky winner from the May monthly contest will win a Single Story BioNovel book, which includes the interview sessions and one hardcover copy. Everyone else is a winner too, as Steven is offering all Pink-Link members a special discount on any length BioNovel. In turn, a matching donation will be made to Pink-Link. To enter the contest, please email Vicki and describe what you wish you would’ve known about a loved one who has passed. At the beginning of July, all responses will be put in a large bowl and winner will be chosen. You must live in the United States to win. Good luck! You can learn more about BioNovel at www.BioNovel.com.